Dalhousie will once again represent Canada at the Student Yachting World Championships (SYWoC) in 2015 after a nearly two-month-long appeal of the qualifying regatta results. The five-time-consecutive winning crew asked Sail Canada to review a decision by the local race committee to drop a result-altering race, which gave the qualifying berth to Saint Mary’s University, a first-time competitor in the regatta. The weekend-long qualifying event was held in November 2014 and consisted of six races, with the boat with the best score from all the races claiming the qualifying berth in the international regatta. Nine schools competed with crews of eight racing J/24s, a popular keelboat class, in the Halifax waters. The early November weather held for the first five races, but the last race proved challenging. “It was freaking cold that day,” Emily Merry, Dal sailing team president, said of the race conditions. After the first five races, the Dal crew knew that they just needed to stay in front of the SMU boat, not even win the race, in order to win the regatta. Memorial University of Newfoundland ended up winning the race, with Dal finishing fifth and SMU finishing sixth, giving Dal the qualifying berth. But immediately afterward, SMU protested that final race to the local race committee claiming unfair race conditions due to the shifty winds. The committee agreed and dropped the race from the regatta, voiding the results, giving SMU the overall win. The Dal and MUN crews immediately challenged the dropped race. 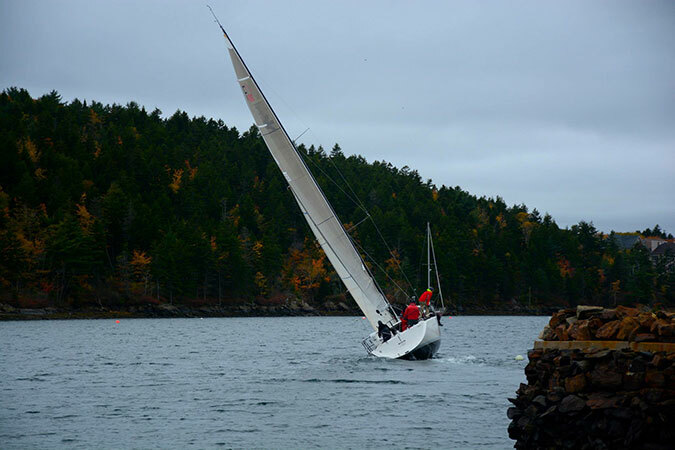 Ted Murphy, alumni advisor for the Dal team and skipper for the regatta, then made an appeal to Sail Canada to reverse the decision of the local race committee, saying the weather was fair and that the original results, the sixth race included, should stand. Sail Canada took six weeks to adjudicate and agreed with the MUN and Dal crews, saying the conditions were fair, with Dal finding out the decision this week. Frank Denis, the executive director for Sail Nova Scotia, said that SMU respects the decision made and cannot appeal it any further. The decision made by Sail Canada is the final word on the matter. “There are no emotions and no hard feelings towards SMU, nor from them,” Merry said. Merry, a third-year industrial engineering student, has been sailing since she was a child on her father’s boat and has been competing since she was 11, so she’s used to the dramas of sailing. If anything, she says, the relationship between the Dal and SMU crews is stronger than ever as the two are hoping to train together over the next year. The SMU sailing program is still in its infancy but proved to be strong competition. “SMU did really well, they were pushing us the entire time, right down to the last race,” Merry said, further emphasizing just how crucial the last race was for all teams involved. The Student Yachting World Championships, now in their 35th year, is an annual regatta held in France with universities and schools from around Europe and as far away as Japan coming to compete in the week-long regatta. SYWoC is a big deal for Canadian student sailors because it’s the only event that has a qualifying stage leading to an international regatta, an opportunity to race against some of the world’s most skilled collegiate sailors.